You are at:Home»Campus & Community»Extended Studies»What Is the Future of Drones in Logistics? Amazon made many headlines a few years ago when CEO Jeff Bezos announced to the media that they were exploring the use of drones to deliver packages to customers in as little as 30 minutes. Amazon is still trying to develop the means to make these rapid deliveries with drones, but has discovered obstacles including airspace limitations that would preclude clusters of drones from flying around the same skies now occupied by airplanes, helicopters, and other types of aircraft. While it remains to be seen whether drones will eventually be widely used for package deliveries, they have found their way into logistics in another useful way. 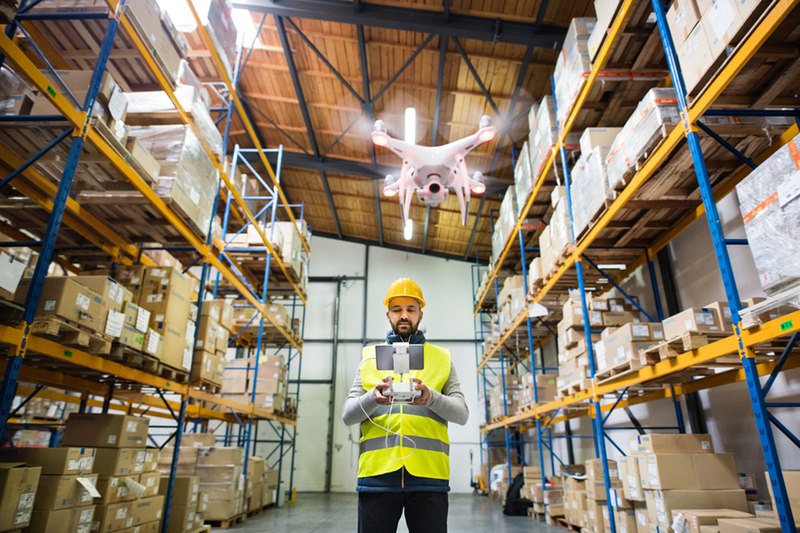 Companies with warehouses full of inventory have begun in recent years to use drones within those warehouses to scan barcodes and take photos of that inventory as a more efficient way to keep track of what they have. Using drone technology to take inventory saves time and makes things easier, since people would often have to repeatedly climb ladders to see inventory stacked high on pallets or shelves. Some companies have even paired drones with robots and mapping technologies to automate the inventory process. A request is sent to a robot, which instructs the drone on how to fly based on previous mapping. No more effort on a human’s part is required, other than looking at the inventory results and recording them. No doubt that process may soon be automated as well. Using drones for inventory may change companies’ warehouse space needs. The future of drones in logistics is likely to change the way products are stored in warehouses, offering more efficient ways to stack products that won’t be subject to a person being able to reach them for scanning or other assessment. If warehouse space can be utilized better, companies may need less warehouse square footage, which will save them more money and building time that can be funneled to other operations. Many companies could benefit from using drones to handle their inventory and other logistical processes. While drones can’t currently transport anything heavy, further modifications may increase the strength of drones or decrease the weight of certain products, allowing drones to be used more often to move inventory from one location to another. The advent of driverless technologies may bring more logistics applications for drones, which currently require a pilot in order to operate in public airspace. As driverless cars and other vehicles become an accepted and welcomed part of transportation, drones may have a chance to become more of a part of the logistics process as well. Next up: how 3D printing will change logistics. Florida Tech offers logistics management degrees to students who want to help companies streamline their processes while remaining efficient and providing good customer service. Learn more about our logistics management program today.